Sunday may have seen the end of the recent heatwave but for the members of Newport Jazz Club the music was certainly hot as they were treated to an afternoon revisiting the legendary Jazz at the Philharmonic sessions first promoted by Norman Granz in July 1944. It was also a welcome return for alto sax man Greg Abate, a graduate of the Ray Charles & Artie Shaw Orchestras, who was here last year on one of his short visits to the UK from his base in New York. 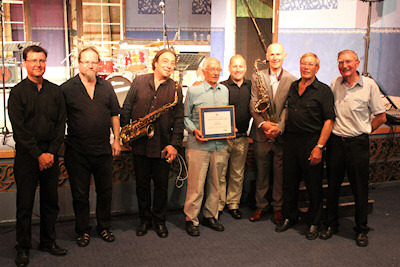 Sharing sax honours on tenor was our very own Gary Plumley and making up the front line was trumpet player Andy Urquart. The audience were soon treated to an afternoon of superlative jazz with several audience members being heard to say during the interval that this was one of the best concerts they could recall. Dipping in and out of the standards songbook it is difficult to pick out any particular number but mention has to be made of a powerful, but sublime, rendition of "Misty" which was a feature for some wonderful interplay between Greg Abate and Gary Plumley. Completing the line-up were Craig Milverton (piano), Nick Page (guitar), Bill Wills (Drums) and Mike Whitehead (bass). The interval saw a surprise presentation of a "Certificate of Appreciation" to trumpet player Cyril Daish on the occasion of his recent 90th birthday. Still playing at jazz jams Cyril is probably best remembered as leading his own band around the island during the heyday of seaside holidays.